There are quite a few racing games knocking around nowadays, but how many of them feature vehicles that not only go so fast they can use their epic downforce to stick to walls and drive upside down, but also fling various weapons at each other while travelling at over 400mph? In that respect, I’d say GRIP Combat Racing is pretty unique. In principle the idea behind GRIP is pretty standard weapon-racing fare. The ultimate aim is to win whichever event you’re taking part in by either driving as fast as you can to cross the line first, or get as high a score as possible by dealing out as much damage as possible to those around you. But where GRIP differs from your usual (let’s face it, kart-based) combat racer is the scope of many of the courses. While there are a few tracks which channel you down narrow pathways for close, collision-filled racing you’ve also got open sprawling areas which give you some rough guidance but generally leave it up to you to figure out the best route through to the end. This could well be enough to put some people off through the frustration of thinking you’ve found an amazing shortcut only to chuck yourself off a cliff, but as with many things in GRIP a bit of time to adapt works wonders. But will people give this the time it needs? That’s a tricky thing to decide. The game starts off quite slowly, with a basic (and fairly uninspiring) tutorial which basically tells you the controls, and then the main options open up to you. The best way to experience the game at a sensible learning curve is the career mode, taking you through a range of racing tiers and events to give you a good chance to get the hang of the speed, handling and weapons on offer by introducing various parts bit by bit. Again, it’s a bit of a slog at first. Early races are simple for anyone with any kind of racing game experience, and while the challenge increases as you get into the 4th or 5th tier it can feel like a drag to get to a challenge fitting of anything beyond a novice skill level. Stick with it though and you’ll be rewarded, not only in terms of more exciting and demanding races, but also with new parts and decorations for your vehicles. As you rank up you’ll also unlock new cars to use with various stats to give you brutally fast but fragile cars, or one that accelerates like it’s trying to reach the doughnut table first, but then tops out at a lower speed than others. 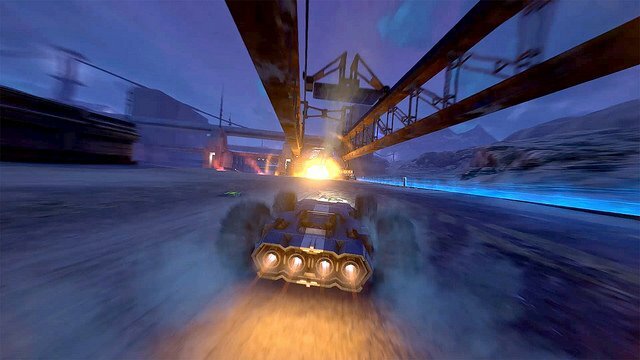 Chopping and changing between various events is useful, for example changing to the more robust vehicles when jumping into a big demolition derby-style event where destruction is the order of the day. So there’s decent variety in races, and some useful variety in the events. Just imagine if you could enjoy all of this with other people! Well, the good news is you’ve got online options which give you a range of different ways to play, and lets you hook up with others around the world to test your skills. Or at least it would if you could find a game. I tried on several occasions and, while I accept I might’ve just been unlucky, could never find an available game. Meanwhile fellow TGRist Matt managed three games, all of which ended up with the host disconnecting and killing the race. That’s something that time might fix as more people pick up the game, but it’s nearly 2019; this kind of lack of network stability shouldn’t really still be a thing. But, good news! If you’ve got enough friends and enough controllers there’s a four player split screen option to give you that always-awesome 90s style of multiplayer which is so often ignored nowadays. I only managed to try it as a 2 player game but that was already far more enjoyable than going alone, so with a group of four of your on the same sofa I can imagine this would be fantastic, and if you find yourself in that kind of social situation quite often then that might be the best argument for picking this up. Between the combat, speed and always-infuriating last second snatched victories this would make a great couch co-op game, as opposed to just a pretty decent single player game. Because essentially, that’s what GRIP is: pretty decent. It’s got a fair bit to enjoy and some of the events are really fun, but getting to the good stuff takes too long and can be a bit of a drag early on, a bit like watching the Star Wars films and starting at Episode 1. 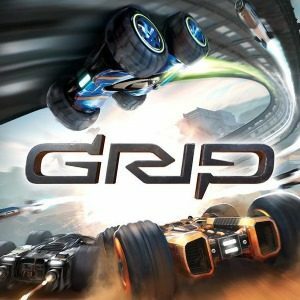 It also feels quite dated, and whether that’s the general arcade-style gameplay or the fairly modest visuals is hard to pinpoint exactly, but when placed alongside some of the other racing titles on various platforms right now GRIP just doesn’t have quite the shine afforded to other options. But what it does have is the right ideas for a fun game. It might not keep you hooked for hours at a time, and you might even be one of those who give up before reaching the more interesting and challenging parts of the game, but there’s some good gaming in here if you go digging. A few useful updates could potentially eliminate that in theory, but right now this is a game with plenty of potential which just doesn’t click through the gears at the right speed.